Another reason for shoppers to get excited about is the S&R Members' Treat on September 25-29, 2013. Five days of exclusive offers, five days of great deals, five days of shopping goodness. I heard many members tend to get crazy hoarders and get up as early 4AM to be in line. 1) DO NOT BRING KIDS. If you have no choice but tag your kids along be sure to bring a nanny. 2) EACH MEMBER/ CARDHOLDER CAN BRING A MAXIMUM OF TWO (2) COMPANIONS. S&R's regular policy allows for a cardholder to bring in three (3) companions on normal days, for their Members' Treat, this is their policy: two companions/ guests per cardholder. Please note that other S&R Store Managers may NOT implement this, meaning you can still have up to 3 adult companions. 3) EACH MEMBER/ CARDHOLDER CAN GET A MAXIMUM OF ONE (1) CART. Good luck to hoarders! 4) SEE THE FOLLOWING GUIDE FOR SHOPPING FOR BIG ITEMS. You need not worry about having an extra cart when getting a table, tent, cabinet, etc. because big items can be picked up out back at the Merchandise Pick Up Unit (MPU) or claiming area. 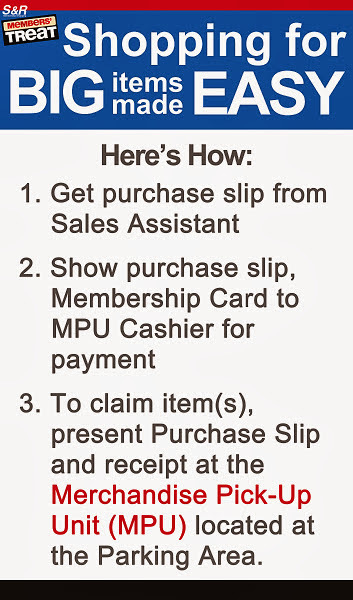 5) THE MEMBER/ CARDHOLDER MUST BE PRESENT. There will be no proxies allowed. That also means, the picture on the card must match your face. 6) FOR CREDIT CARD TRANSACTIONS, ONLY THE CREDIT CARD/S OF THE ACTUAL MEMBER/ CARDHOLDER WILL BE ACCEPTED. However, the spouse or immediate relative (parent or sibling) may pay for the transaction using their respective credit cards provided that they hold the same last name/surname as the cardholder. 7) ONLY A MAXIMUM OF TWO (2) TRANSACTIONS PER CARD WILL BE ALLOWED.If you're buying for a number of people, don't expect S&R to ring these up separately, do the math after you pay. 8) BUY 1 TAKE 1 ITEMS WILL BE REPLENISHED EVERYDAY. This means they will be available from Wednesday thru Sunday. No need to fight over stocks, people! Let me reiterate that some S&R stores may not be strict on implementing the above rules, it will depend on the volume of shoppers and on the store manager's discretion. Last but not the least you just have to have loads of patience. This will be my first Members' Treat and I'm so psyched about it. Hope to see you there. McArthur Highway, Matina, Davao City.